President Barack Obama waves as he walks on the South Lawn of the White House in Washington, Sept. 7, 2015. Democrats in the U.S. Senate have rallied 41 votes — enough to block a resolution opposing the Iran nuclear agreement. This means President Barack Obama will not have to veto such a measure, which is a significant political victory for him. White House Press Secretary Josh Earnest said the administration is gratified by the growing support seen in Congress. "What we hoped when the agreement was initially announced in mid July is that members of Congress would carefully consider the agreement, and spend time with experts in the intelligence community," he said. Earnest added that the administration would expect those members of Congress who support the agreement to take the necessary steps to prevent other members from undermining it. The Senate came back into session Tuesday afternoon after the August recess. Republican Senate Majority leader Mitch McConnell said Iran will emerge even stronger if the Iran nuclear deal goes into effect and economic sanctions are lifted against Tehran. 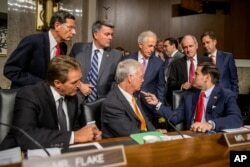 He called on every member of the Senate chamber to be present Wednesday when the Senate begins debate on a measure of disapproval against the Iran deal. He called for a respectful and serious debate. McConnell said he would ask every Senator to keep in mind that while Obama will be out of office in a few months, the rest of the world will have to deal with this deal for much longer. Senator Minority leader Harry Reid, a Democrat, said no has come up with an alternative to the deal — "any alternative is fantasyland." He called on McConnell to move quickly to hold a vote on the Iran nuclear deal, and not to make the Senate go through unnecessary procedural hurdles. FILE - Sen. Barbara Mikulski, who supports the Iran nuclear deal, and Sen. Charles Schumer, who opposes it, are seen during a news conference on Capitol Hill in Washington, June 2015. The United States and five other world powers [P5+1] reached the agreement with Iran in July. The deal would curb Tehran's nuclear program in return for an easing of sanctions that have hobbled the Iranian economy. The U.S. and its allies have long suspected that Iran was using that program to build nuclear weapons — a charge Tehran denies. Republicans hold a large majority over Obama's Democratic party in the House of Representatives. The House is expected to pass a resolution opposing the Iran deal, but without Senate support it will amount only to a symbolic gesture. Obama pushed lawmakers hard to support the Iran deal and had already secured enough votes to prevent opponents from blocking it; but now, congressional opponents will not have the chance to force the president to wield his veto power. Still, the debate has given critics a further chance to voice their complaints about the agreement. Opponents see the deal as too friendly to Iran by leaving much of its nuclear program in place while unlocking billions of dollars that some fear will be used to support terrorism. VOA White House Correspondent Aru Pande and VOA Capitol Hill Correspondent Cindy Saine contributed to this story.